There are so many new movies on Netflix that it’s hard to decide which one to pick. I Am the Pretty Thing That Lives in the House is one of my new favorites. It’s rare to find a movie with so much controlled suspense in the horror genre that doesn’t eventually turn into something much more gruesome. The chilling psychological thriller by director Oz Perkins (son of Psycho’s Anthony Perkins and director of ‘The Blackcoat’s Daughter‘) is haunting and full of atmosphere. It is a truly amazing movie. As a person who generally likes less subtle horror and gets bored easily, I was surprised at how I was gripped and held tight by this film. 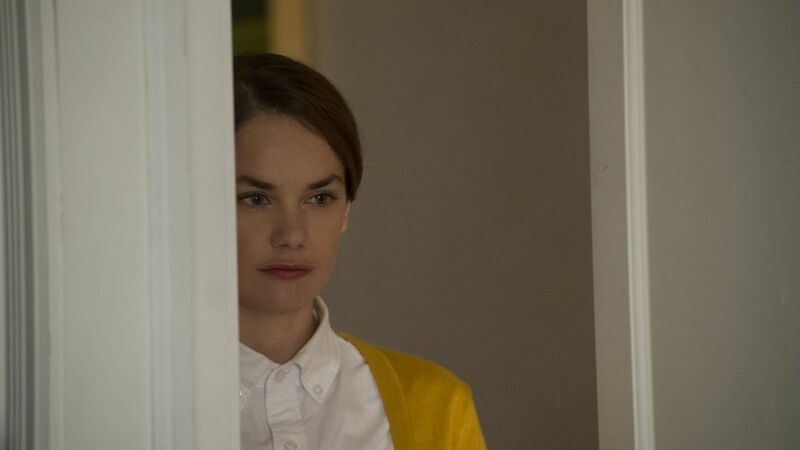 A hospice nurse, Lily (Ruth Wilson from The Affair), is hired to watch over a famous writer, a sickly recluse who never leaves her house. Most well-known for one of her novels, The Lady in the Walls, Iris Blum (Paula Prentiss) lives in a house with a ghost — a ghost we see (or do we?) right from the beginning and get to know, as her story is revealed. The title of the book, and the voiceover suggesting that the dead are only dimly aware of how they died, gives us a clue as to what could be behind the supernatural happenings that ensue. The idea of the story is set in the earliest of scenes, and we are told what is to come by the narration of our lead character Lily. But without evidence at that moment, to back up her dire and odd statements, I felt the need to keep going…to see what she was talking about. Stating that she is 28 and will never be 29, it was very compelling for me to find out why. How could she know that, right off the bat, when she first enters the old lady’s home? The house itself is big, bright and airy, but you feel the foreboding anyway. Even with the windows open, the house feels closed in, alive and sinister. The fear hangs there, just like a spider in a web might, barely visible, but ready to wrap you up as its prey. The unease is felt from beginning to end, where one big, long jump scare, takes your breath away. For those made uneasy by the dark, this movie will work its way into your flight place very quickly. It places you firmly on the edge of your seat and leaves you there for the entire movie. As I watched it, I felt chills up my spine and the need to look over my shoulder in my own darkened house. It’s hard to tell if what you see in dark hallways is real, or just your imagination. The soundtrack was creepy as well. Musician Elvis Perkins, (the director’s brother) helps elevate the suspense too, with menacing, off-key piano riffs and ominous ghostly sounds. 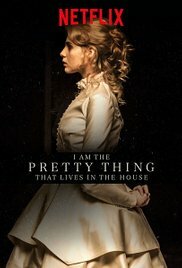 I Am the Pretty Thing That Lives in the House is a Gothic horror that is primarily about death itself. Our aging writer is close to death, the protagonist in her book, The Lady in the Walls, Polly, is passed, and our nurse Lily has already told us she will never have another birthday. As the movie progresses, I started to feel like Lily was Polly…or is it the other way around? Who is really the ghost? Flashbacks show us that Iris was never the same after penning the book. Is it a fictional story from her imagination, or did she just write down a horrible true tale, whispered to her by a ghost? Iris always calls Lily the name of the young bride in the book, Polly. Even though her charge has Alzheimer’s, it eventually causes delicate and self-proclaimed scaredy-cat Lily to open the book and read it — well only one page, but the words were almost exactly her first words in the movie. 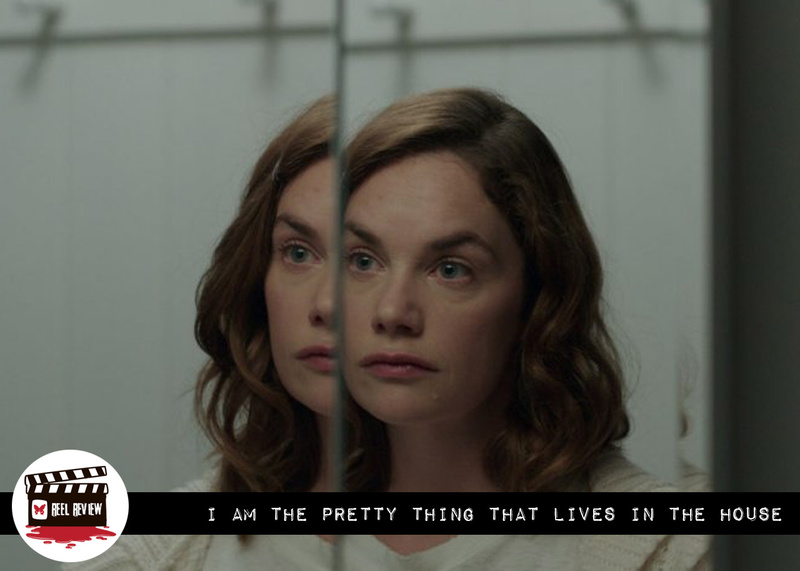 ‘I Am the Pretty Thing That Lives in the House’ may be too slow for traditional horror fans. But those who take the time to allow the movie carry you on its beautiful, slow, dreamy ride, will be happy that they took the time. It’s a truly wonderful film, and I hope that lots of people give it a chance!